Here’s a short post by Jason that helps. GeoIP service Shopify currently uses to generate that map isn’t quite reliable when the order address is written in Cyrillic. It sometimes shows wrong locations, which can be a little confusing to your customers. I’d rather avoid that unnecessary feature. Your content manager will be thankful for this! Drag a link to your bookmarks bar and be able to jump to product/collection/blog edit page straight from its frontend URL. Get it here. Ask questions/give kudos here. UPD 17/05/16. Doesn’t work in Chrome now. ‘Metafields’ is another way of saying custom fields. They can be added to almost anything in Shopify: products, variants, collections, customers, orders, pages and on the store level. Imagine how powerful Shopify becomes with this kind of extension! You can manage metafields via different apps or using API. I’m testing two apps now: Metafields2 and Custom Fields for Shopify Сhrome extension. Currently, I didn’t find a way for metafields created in one app to be seen with another. But I hope this will be resolved somehow. Some ideas how this may be used in your store can be found in this video. Also, if you plan to create an XML file for some marketplaces that sell your products, you’ll probably need this to add custom product specs like materials, screen size, resolution, country of origin, etc. I’m going to write a separate post on Shopify custom fields, so stay tuned. You can find it here: https://your-store-name.myshopify.com/admin/orders.rss and then pipe it to some of your apps. For example, you can notify your team’s Slack chat or create items in Podio (think order management) with Zapier. I’ve created an RSS feed with all our products using Shopify’s native webhook notifications and fed it to Mailchimp RSS driven campaigns. Now I have a daily newsletter with all our new products. A piece of cake! This feature can be very powerful if you don’t want to hire a software developer and mess up with Shopify API but still want to accommodate your business’ workflow. 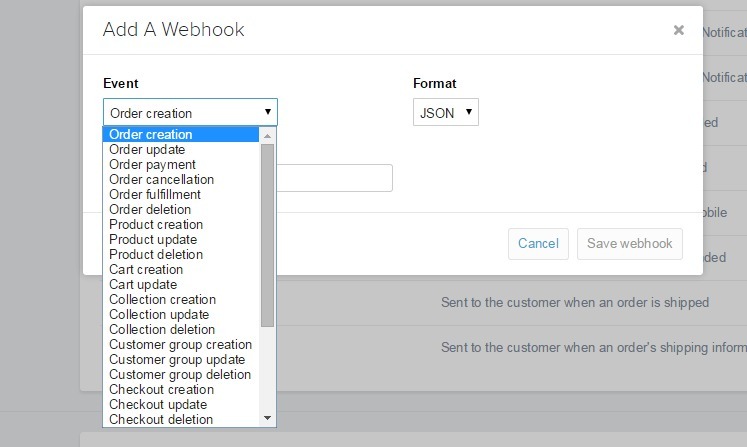 Webhooks can be created at your store’s notifications set up page. There are a few easy steps to follow. First, you need to create a webhook trigger in Zapier, grab the newly generated hook URL (it should look like this: ‘https://zapier.com/hooks/catch/xxxxxx’). Second, you have to go to your store notification settings, navigate to Webhooks section, click ‘Create a webhook’ link. Then choose which event should fire the hook, choose webhook format (if you don’t know what the heck is JSON, choose XML) and put there your zapier hook URL. Now Shopify will send Zapier a signal whenever somebody creates a product or an order at your store. You can now create a zap with this event as a trigger. For example, you can send somebody an sms each time an order has been cancelled or a refund issued. Go to your store admin and see what you can pick as a trigger event. There are tons of services already connected to Zapier and new ones are being added every week. Just check out their Zapbook, if you are not yet familiar with this awesome service. Also, I can tell you how we use Google Spreadsheets for semi-automatic updates of inventory for dropshipped products; how we hacked Power Tools app to work with Russian language and discovered a useful ability to group different product options under one filter (should work with any non-latin language). These are possible topics of my future Shopify Tutorials, but I hope to get some feedback on this post at first.